You remember the movie ‘Grease’. The song, Summer Lovin', had me a blast. Anyway, it was something that Olivia Newton-John and John Travolta sang to each other. Today, in the Love Report, David and I talked about some of our favorite summer memories. What it was like and why dating is so much different in the summer. It's literally a walk down memory lane, but also some groundbreaking tips for you to be able to attract love this summer. Because you know, no matter how much David and I enjoy sharing about ourselves, our past, our future and our present... We always make sure that we give you plenty of tips to find love, especially in the summer time. Summer is so much fun. Summer to me is... well, you got to listen to the podcast today to really hear about some of our favorite summer escapades, and let me tell you something, we both confessed some really funny stuff. We'll see you on The Love Report. Patti out. Hey everybody, Last week Love Report was so strong and we got such great feedback we decided to do a little bit more about manifestation.Of course, there's a little playful teasing going on between David and myself. See, I kind of think David doesn't date age-appropriate women. You know my theory, 10 up/10 down. I think David is slowly inching his way down to 20 down and zero up. Then again in David's mind, that's the adding 10 up and 10 down gives you a reason to still get 20 down. So, listen in. See for yourself if David is dating age appropriate women, or is he going to manifest and bring on exactly what he doesn't want. Talking about manifestation. We go deeper today, David and I go even deeper into manifestations and how to really bring in what you want instead of literally bringing in what you don't want. So many people don't understand the power of what you think about, you bring about. So today, we go deeper into this and really help you understand that all your thoughts are exactly -- is energy you're sending out to the universe. When you send these thoughts out to the universe, you're getting exactly back what you have just put out there, which usually is not what most people want. So today's Love Report is a little heated, I must say, between David and myself. But it's one of my all-time favorite topics, and it comes right from my heart, because I want to see all of you get the love that you deserve, because that's what I'm here for, the reason why I went into match-making, so I can not only work through my own stuff, because you know we're all working through every single day, but to literally get all of you to meet and really find somebody you love. So, today is a very deep, great subject that I think all of you will enjoy. Hey Everybody, Sorry, we've been away for a while. But the Love Report is back! And it's back with a bang. Or for some of you in monogamous relationships, it's back with maybe a whimper and a little less banging. Join David and I today as we talk about relationship monogamy and monotony, and how to really overcome some of that when your relationship is just in that, oh-so-funky-slow period. You’ll get a front row seat, as David confesses today about his raging single life (it’s pretty steamy). Who's he dating? What type of woman does he like? Now I know all this because I've known him for so many years, so I know the exact type of woman that he likes. And I give him a little tease here and there about where he's meeting all these women. And… I'm going to share something about my personal relationship that's just going to — well you have to listen to find out. Alright, see you on the Love Report. Patti out. Want to know why you get hit on by losers, while the quality guys stay away? Do you wonder why the same women seem to attract the one great guy at the bar, at the dinner party, at the wedding… And you end up feeling like the Cinderella’s step-sister? Are you at a loss to explain to your friends and family why you’re still single? Isn’t it time your glass slipper fit? Most women don’t realize they send signals every day that are actually keeping the good men, the quality men, the marriage minded men out of their lives. I see it every day and it’s the simplest thing you can change, quickly. 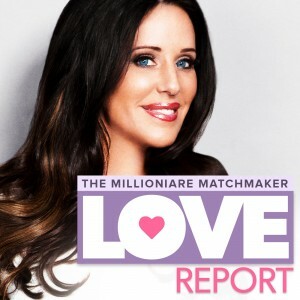 Listen to today’s ‘Love Report’, as David Wygant and I explain what unconscious things you and millions of other women are doing wrong. How the subtle signals in your body language and your clothes could be repelling the very men that are trying to attract. And how you can make the small changes in your approach that will bring huge changes in the quality of men in your life!